So where does all the Blackjack hype come from? Surely it has something to do with the viability of counting cards. Blackjack was originally played in French Casinos of the 1700�s and was known as vingt-et-un or Twenty One. Since then, the game has certainly evolved and gained mass appeal with players all over the world. Take a look at the early days of Blackjack, objectives and card values, how to place a bet and find out which variations of the game are being played today. Once you�re armed with all this Blackjack info, we let you know where to find the best games of Blackjack online. Find out more below. One of the most widely played and popular casino games in circulation, Blackjack (not to be confused with the UK card game Black Jack) keeps punters on their toes with a heady mix of chance and skill. Often controversial and a talking point where the viability counting of cards is concerned, Blackjack dates back to French casinos of the 1700's in which it was played as vingt-et-un or Twenty One. It is safe to assume that the game's lasting popularity and number of devout players is down to the mix of chance and strategy combined with the introduction of variations to the original game. The main quirk of the contemporary Blackjack game is that it may not necessarily contain a jack, or any black cards for that matter. Rather, the name stems from the bonus origins of the game. Initially, bonuses were offered to entice players to the then new and slow to gain momentum game in the United Sates. Gaming houses offered a Blackjack bonus to players in the form of a 10-to-1 payout if their hand was made up of the Ace of Spades or a Black Jack - either the Jack of Clubs or the Jack of Spades. This hand was named Blackjack and although the bonus did not endure, the name was appropriated by the game and has held since then. The aim is simple - don't go bust. The objective of casino Blackjack, table Blackjack and variations of the game is to hold cards that total 21 without exceeding this amount. The hand with the highest total wins provided it does not exceed 21. The best possible hand is called 'Blackjack' or a 'Natural' - i.e. a face card, King, Queen or Jack and an Ace. In short, a two hand card of 21. Otherwise, a winning hand is one in which the player has more points than the dealer without exceeding 21 - the highest hand in points and also the reason why the game is at times referred to as 21. A winning hand usually pays 3:2 on the players initial bet although some casinos have undesirably reduced payouts to 6:5. In the case that both player and dealer have a Blackjack, the bet is known as a 'push' - meaning neither the player nor the dealer wins the hand. If the player and the dealer both go bust, the player loses the bet.Each player is in direct competition with the dealer and aims to beat the house with every hand. Firstly, the player must wager a bet prior to the dealer dealing the cards - either from a shoe holding 4 or more decks or from 1 or 2 hand held decks, also known as a 'pitch' game. The dealer deals 2 cards to each individual player and to him/herself, one of which is face-up and as a result, visible to all players and most commonly referred to as the dealer up-card. The other card is dealt face down and is referred to as the 'hole card'. Basically, the hand starts when each player wagers a bet in front of them. Online blackjack at online casinos is much the same as wagering inland casino games, the difference being that the player selects a wager amount by clicking on a numbered chip. Once both the dealer and the players are dealt their respective cards, the round begins. As one of the dealer cards is visible to the players, the strength of the dealer's hand can be determined by checking whether the dealer has an ace or a ten, in which case it is possible the dealer has a blackjack. The dealer having a blackjack would result in all other players losing their bets bar those who also have blackjack. 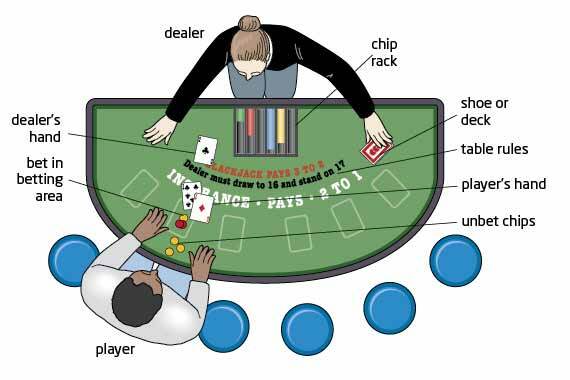 In the case of both player and dealer having Blackjack, the player's hand becomes a 'push'. In US blackjack games, the dealer does an immediate check for blackjack if possible and collects all losing bets at the onset if he indeed has a blackjack. So what happens when the dealer does have an Ace up-card? This is where the option of insurance comes into play. Players are afforded the opportunity to take out insurance against the strength of the dealer's hand. A blackjack insurance bet pays 2:1 in the case of dealer blackjack. In the event the dealer is showing an ace and the player has a blackjack, the dealer may ask the player for 'even money'. This means the player loses their original bet unless they also have a Blackjack. The net effect of the insurance bet is to break even. Insurance can be considered here as a side bet. In this variant, the player is dealt two hands and as the name suggests, is able to switch the top two hands between cards. For instance: Player is dealt 10 - 7 and 8-10. Player is able to swap the top 2 cards of each hand to make hands of 10-10 and 7-8. The Catch? Blackjack naturals are paid 1:1 as opposed to the regular 3:2 and dealer 22 is reduced to a push. A popular variation, which allows the player to surrender the hand after viewing the face-up dealer card and only losing half of the initial wager amount. The English variation of the Blackjack game has the same objective as the original but also encompasses some differences. It's worthy to note that in Malaysia and Australia, Pontoon is the name for an unlicensed version of 21. Basically, in Pontoon all cards have the same point value. However, there is no dealer up-card. Pontoon vocabulary also differs from regular Blackjack language. Think of a Blackjack Natural - a 2 card total of 21 made up of a face card and an ace, right? Same goes for Pontoon, in which the term Natural is called Pontoon. In Pontoon, to take a hit is to 'twist' and to stand or decline another card is to 'stick'. In Pontoon, the player must 'twist' - take a hit on any hand amounting to less than 15, unless he has already been dealt 5 cards. Pontoon pays out 2:1 on the players bet. Put simply, the foundation of basic Blackjack strategy is calculating numbers. When adhered to accurately, it lowers the house edge to a minimum, being approximately � a percent, dependent on some rule variations put in place by different casinos. Minor modifications need to be applied to basic strategy in response to differing rule variations applied by casinos. One example - Certain casinos allow you to double down after splitting (DOS) while others do not. Another example is that basic strategy changes need to be made for single and multiple deck games. Success at Blackjack requires the learning and implementation of basic strategy. Basic strategy charts for reference are a good way to start and guide the player through how to play the first two cards in response to the dealer up-card. Let's say you're first dealt two cards - 3 and 5, making a total of 8. In this instance, the chart will instruct the player to hit. Player draws another 3 and now has a total of 11. The chart would then instruct the player to double on 11; however it is only possible to double on the first two cards. In this case, it is then becomes clear that you need to hit. The highest 2 card combination and the object of the game. Made up of an ace and 1 face card with a ten point value, if you are dealt these two cards, brilliant - you have 21 in total - a Blackjack or a Natural. If the dealer also has a two card 21, the bet then becomes a push and the player neither loses nor wins. If only the dealer has a blackjack, he beats all other players. To take a hit means to ask the dealer for another card. This is done by physically tapping the card in front of you, signaling to the dealer that you are prepared to accept another card. In online blackjack games, the player is required to click 'hit' before being issued another card by the system software. To stand is to reject the dealer issuing further cards, either after the initial deal or after a hit. Waiving your hand over the top of the cards will effectively signify this. To double down is to double your original bet after having been dealt your first two cards. Example: If the player's original bet was $15, the player has the possibility to up the bet by an additional $15 to a total of $30. A variation of this is to increase the bet to less than double the original - know as 'double down for less', which is not always permitted. If you are dealt cards of the same value, you have the opportunity to split the two into two separate hands, provided you make a wager equal to your original bet. Signal to the dealer that you intend to split your bet by placing your second bet alongside your original in the betting circle. The dealer will do the rest for you, i.e. by separating the cards. You will be dealt an additional card to go with the first and then you must decide to hit or stand on the split. Once you reach a stand on the first card, the dealer will move to the next until the process is carried out for both cards. Again, some casinos allow double down on the first two cards after a split. As outlined earlier, if the dealer's up card is an ace, players will be offered insurance, which should be considered more of a side bet rather than an actual insurance policy on the hand. If the player takes the insurance side bet and the dealer has a ten, the player is then paid 2:1 on the insurance wager and loses the original bet, resulting in an overall push. If the player has a Blackjack and the dealer has an ace, the player will be offered 'even money' for the Blackjack rather than 3:2. Should the player reject the even money offer, a push may result if the dealer has a Blackjack. Note that the house has a big edge where insurance bets are concerned. Factor it likely that the dealer will not have a ten more times than they will. Allowed by some casinos - Player gives up hand and only loses half of their bet. Player surrenders cards before dealer checks for Blackjack. Dealer first checks if he has Blackjack, and in the case he does, surrender is then prohibited. All the grandeur of a European casino and then some, this online casino site has sophisticated graphics which are impressively showcased at their online Blackjack tables. Take a tour of EuroGrand and play for practice. Get acquainted with classic Blackjack and its popular variations. EuroGrand lets you try out the original Blackjack, Blackjack Switch, Surrender and Pontoon. Practice play starts with an injection of �2000 into your account. Maximum bets are �300 so take the opportunity to bet big for fun and learn the in's and out's and do's and don'ts of the online Blackjack games. Should you get stuck, help and advice is on hand in the form of prompts during play. Less grand, but welcoming all the same, 32Vegas is laid back and has a relaxed feel. Play hands of Blackjack, Blackjack Surrender, Pontoon, Blackjack Switch and progressive Blackjack - as a single player hands, 3, 5 hands or multiplayer. The colour scheme is attractive and graphics are crisp and clear. For players new to online Blackjack and just starting out, getting to know the ropes at 32Vegas is perfect. It's not intimidating yet offers all the help and support you need when learning to play. Clear, good quality graphics get you acquainted with the online casino world and the game and simple prompts assist in the area of basic strategic play. Play on the downloadable version or Flash interface and enjoy. Prestige Casino is an esteemed place to play. With its sophisticated feel and high quality graphics, it's hard not to be drawn to this online casino. Not only is the site easy on the eye, a player can't help but feel like a high roller and being somewhat partial to the wood grain look of the Blackjack table . These refined elements add an air of style, class and prestige to the overall feel of your game. Game selection at Prestige is excellent where online Blackjack is concerned. Play classic Blackjack, Pontoon, Blackjack Surrender, Blackjack Switch, Progressive Blackjack and 21 Duel Blackjack. An extensive game selection is beneficial for new players in understanding game rules, odds, strategy and variations of the Blackjack game. Often a simple prompt question such as "You have 17, are you sure you want to hit?" can guide a novice through basic strategy. Straightforward to install in download and flash versions, play for fun and remember to check out 21 Duel Blackjack for an interesting spin on the original.